So now you’re ready for painting rocks and coloring your scenery foundation. You have built your terrain, covered it with plastercloth and incorporated various rock castings and land formations into your layout. Painting these formations will really start to make your layout look like something recognizable. Also, this is where you can be artistic without having any talent (at least in my case). I would suggest painting the foundation first, then painting the rocks, though you could do it either way. The process is different for both as you will see. If you’ve covered most of your terrain with plaster cloth like I usually do, you will probably want to paint it with some neutral tan color just to cover the white plaster, before you lay down your ground cover. If a little tan earth color peeks through your ground cover that’s okay, but you don’t want white peeking through. I usually use a tan or light earth color and dilute it by ½ with water. It covers well enough that way and goes on easier, getting in all the nooks and crannies. Avoid getting this on the rocks, however, because they will be painted in a different way as described below. Don’t be afraid to blend in other colors in different areas of your layout – for example, a brownish green color or darker brown or gray may be more appropriate for different areas. Some variety in your coloring will look more realistic, even though much of the foundation will be covered later by ground cover. •	For burnt umber, concrete, stone gray, yellow ocher, and white acrylic paints, use 1 part paint mixed with 16 parts water. •	For black, raw umber, and slate gray, use 1 part liquid to 32 parts water. The reason for using washes this dilute is that when you use these washes in painting rocks, it’s very forgiving. You can make all kinds of mistakes and not really have to worry about it because you’ll still come out of the process with an excellent result. When you’re ready to paint, dip your brush into the wash, and apply the wash to different areas of your rocks. Don’t try to paint the whole rock one color. Woodland Scenics calls this the “leopard spot” method, because that best describes what you are doing – painting a spot here and a spot there. If you have other rocks or rock walls to be painted, do the same thing on those rocks before you finish with the color you’re using. Then rinse out your brush in a container of plain water and begin the same process again, this time dabbing the color on different areas of the rock or wall. If the colors run together, that’s okay. They should blend in together anyway. Now move on to a different color and do the same thing, and so on, until all the white areas of the plaster rock or formation have been covered. At this point your rocks are probably still too light in color, so you will need to continue the process, repeating some of the colors and blending them in till you get the right shade that looks realistic. You can always add more washes of different colors to darken the rock. It’s harder to lighten a rock that’s too dark, but you can do this by using plain water on your brush if the paint isn’t too dry yet, or you can use the white and yellow washes to lighten up the tone. If you really don’t like the color you end up with on the rock and want to start over, spray the rock with hot salt water to wash away the color and begin again with the washes. After you’ve done all the spotting of colors on your rock, you may be satisfied with what you’ve done and stop there. However, if you wish, you can then choose one dominant color that you want to use to blend them all together and set the main color tone for your rock. 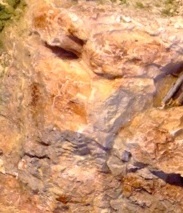 The dominant color could be burnt umber, which will give the rock a brown color tone. If you want more of a tan effect, you would use raw umber. If you desire more of a gray tone, choose stone gray or black as your dominant color to wash the entire rock. After you’ve chosen a dominant color then you can spray the whole rock with a wash of this color. After it’s dried, you can add a spray of black wash to help better define the cracks and crevices in the rock. There is one more step in painting rocks that I like to do. That is to take a small artist’s brush and add a few streaks of full-strength acrylic paint to certain areas of the rock to add interest and a little extra color and then use water on the brush to help blend it in. Be careful not to do too much of this. You don’t want your rocks to be garish or too colorful. That would be unrealistic unless you’re modeling Sedona or the Painted Desert in Arizona. At the end of this process your artificial rocks are suddenly very realistic landforms, which will greatly enhance your model scenery and the overall look of your ever-improving model railroad layout empire. The next step is ground cover. You're on a roll now! 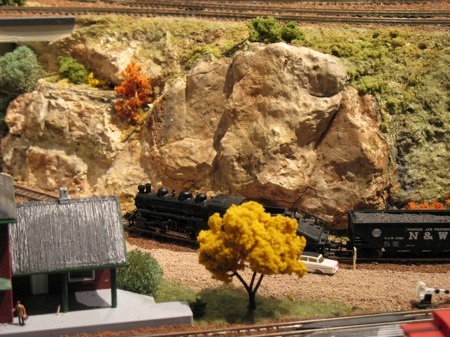 From "Painting Rocks" to "Model Train Scenery"
From "Painting Rocks" to "Homepage"